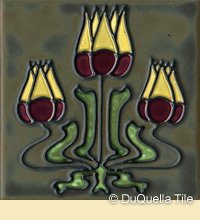 Arts and Crafts tile are found throughout our online art tile catalog. See the many tile designs and patterns for Arts & Crafts style in our SQUARE TILE COLLECTION and our BORDER TILE COLLECTION. There are many other ideas and photos throughout our catalog. 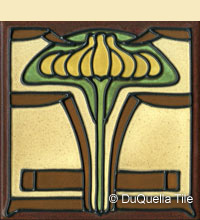 Many of our Art Deco and Art Nouveau patterns work within the Arts & Crafts style when appropriate glaze colors are used. The Arts and Crafts movement of the late 19th and early 20th centuries was in part a rebellion against mass production and an increasingly industrialized culture. Instead, those who ascribed to the Arts and Crafts movement focused on creating items by hand from natural materials. This style is still wildly popular today and reflected in many of the tiles we design at DuQuella Tile. Click Here for Arts And Crafts Tiles! Here at DuQuella Tile, our unique assortment of hand crafted decorative tiles makes it possible for even the dullest of spaces to shine. Decorating with our tile creates unique opportunities for interior design that standard ornamental mediums do not. Our Arts and Crafts tiles are created using authentic techniques and coordinate seamlessly with our field tiles. A stunning assortment of pieces whose designs are inspired from a variety of natural subjects, our Arts and Crafts tiles have something to suit just about every aesthetic. Once you have selected the tiles you like best, we will be happy to work with you to create an overall design idea. Whether you want a simple border for your bathroom or kitchen decor, including backsplashes and murals, rest assured we can accommodate. As a family of master tile craftsmen who specialize in hand crafted Arts and Crafts tile and custom pieces, we relish the opportunity to connect with new clients. For more information about Arts and Crafts tile, or if you would like to see images of some of our work, please continue to browse our online showroom. We also offer assistance with the layout of all of our tiles. For any questions you may have, please don't hesitate to EMAIL US or call Toll Free 1-866-218-8221 today. We are always happy to help!